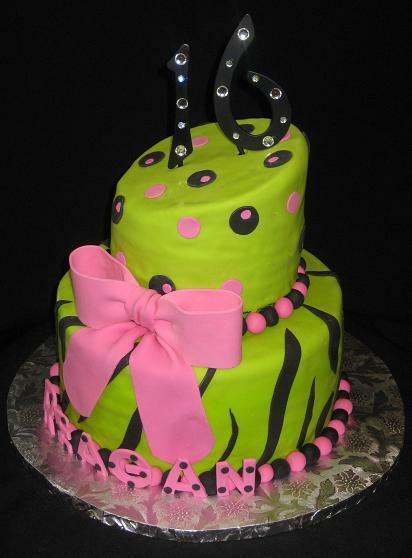 These sweet 16 birthday cakes were made special for each young lady. ”Thank you for an awesome sweet 16 birthday cake! Maggie was so excited when she saw it. You and your husband simplified everything for me by not only making the cake but delivering it too. It was so nice to have him keep me updated on his location during the delivery and to let me know exactly what time he would be arriving. He came with a smile on his face and a perfect cake. It made the evening so memorable. I had no idea what to do for her birthday and then all of it came together with a limo for her and her friends, an awesome meal at a downtown Raleigh restaurant, and then home for dessert with your sweet 16 birthday cake. It was absolutely delicious and all of her friends loved it. The whole thing intrigued me and it was so much more than i expected. The many layers within each section and how you attached the top to the bottom was an extra surprise when we cut in to it. Thank you so much! I would recommend you to anyone who is looking for it all. Looks as good as it tastes! 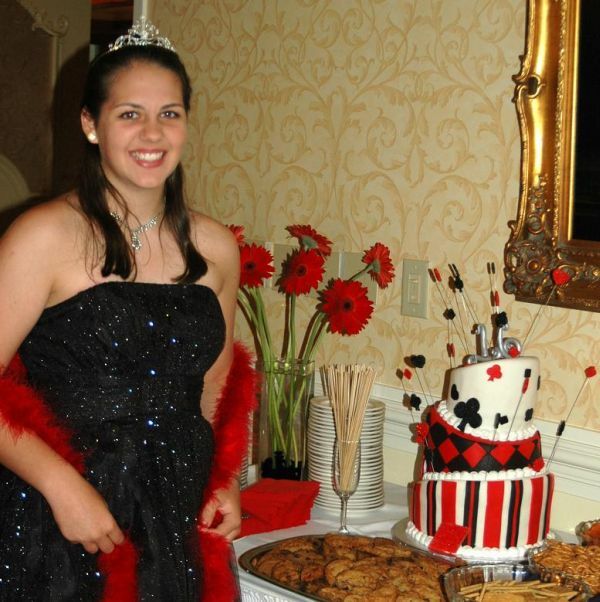 This sweet 16 party ideas theme was casino night at the Raleigh Country Club. 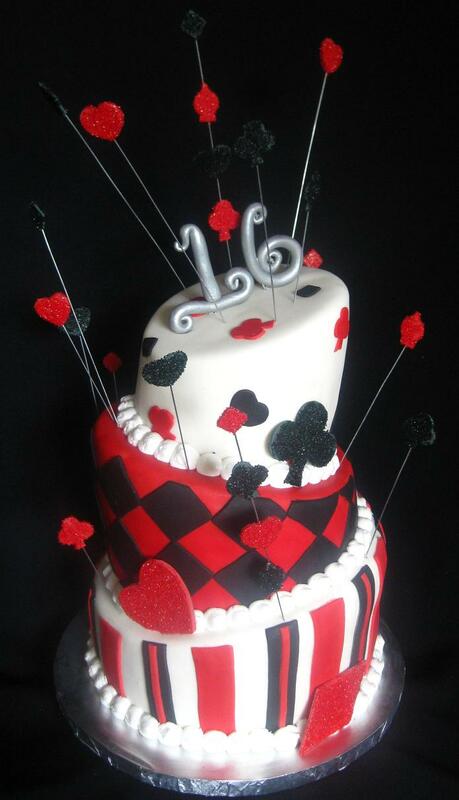 Loving parents Ed & Mary Ruth ordered this casino cake for their beautiful daughter Sarah's special 16th birthday celebration. The cake flavors were chocolate and vanilla with butter cream filling. 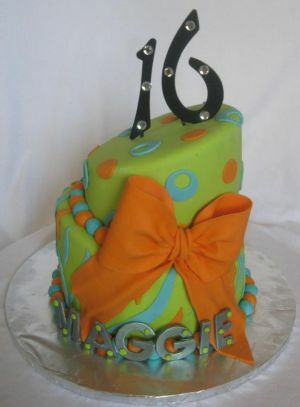 The cake was covered and decorated with our hand made marshmallow fondant; yummy! Working with the casino party theme colors of red, black, and white gave it a look that made a great centerpiece for the event. ”Hi Stephanie, the Casino Cake was ABSOLUTELY PERFECT, and my daughter LOVED IT! Thank you so much for making us such a FABULOUS Cake! This cake was made special for a Jordan, a wonderful young lady. The cake flavors were chocolate, vanilla, and marble all covered with buttercream and decorated with your hand made marshmallow fondant. Happy Birthday Jordan ~ You Deserve The Best! She only turns sixteen once. 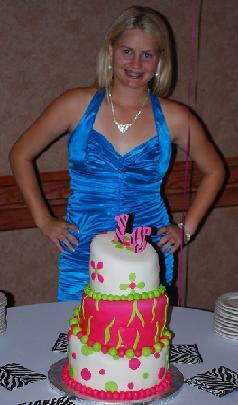 ”Here is a picture of Tiffany and the topsy turvy cake! Thanks so much. 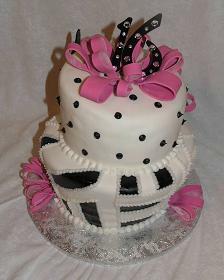 Just wanted to tell you the cake was great and beautiful. We put zebra stripes on the number 16 as well as the center tier. 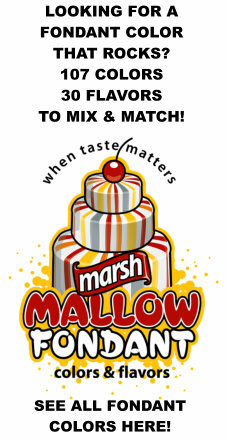 The cake flavor was vanilla with butter cream icing covered with our hand made marshmallow fondant. All of the decorations were edible except for the number 16. ”Hi Steph, here are a couple of pics. When he walked in with her sweet sixteen cake she said wow look at that pretty cake. Then she saw her name and said, oh that's MY CAKE it says Reagan on it! They had fun and man the cake was delicious, wonderful, and absolutely gorgeous. She was very pleased and so were we. We have not gotten into the bottom layer yet but I have it in a cake protector so hopefully we will enjoy it later this weekend. Everybody thought it was gorgeous and I told everyone to go to your Website. New business is good, right? 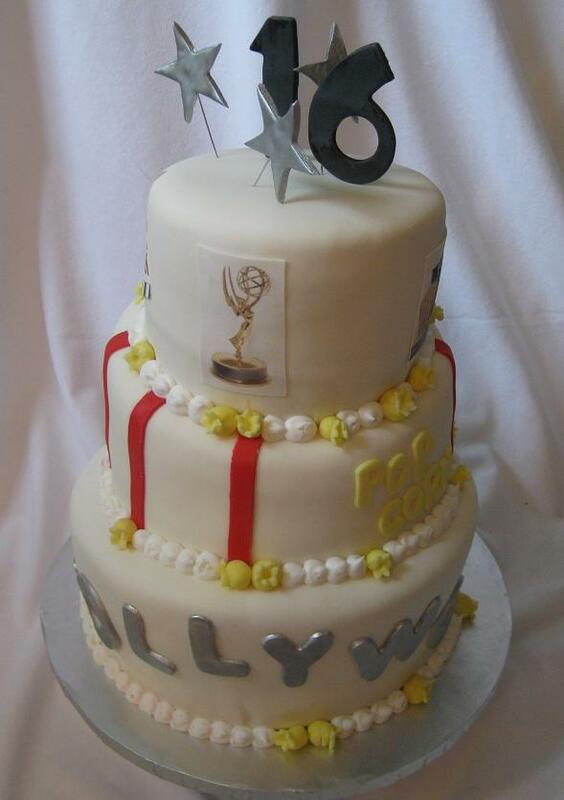 This hollywood cake was ordered by Johnnie C. from Zebulon, NC for her daughters sweet 16 birthday. 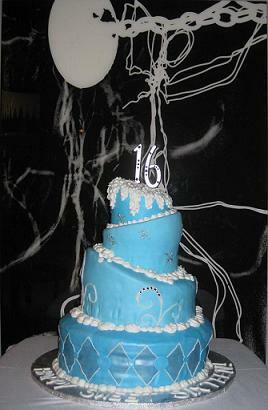 The sweet 16 birthday cake flavor was white with buttercream icing. 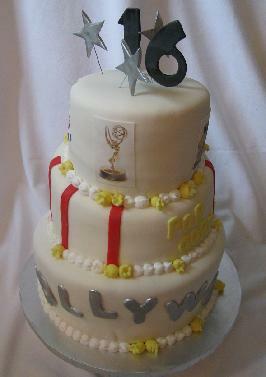 The hollywood cake was covered and decorated with our hand made marshmallow fondant. It was all edible, even the pop corn and pictures. We used our edible printer with edible frosting sheets and edible ink. To see the entire cake play the hollywood cake video below and see how much fun we had making it! 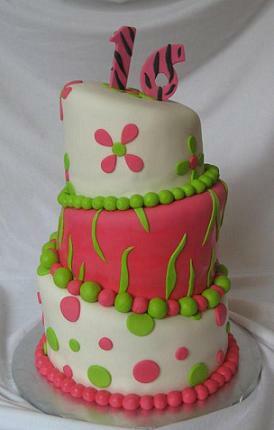 This is a time of celebration and a turning point where a birthday cake can make someone special feel special. 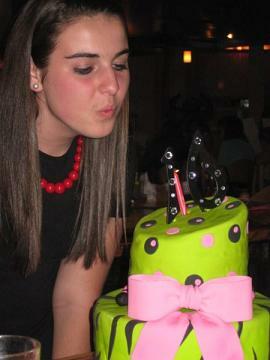 Her mother, Gwen of Willow Springs, ordered Katlin’s sweet 16 birthday cake. Gwen is a sister of Marie who is a returning customer of ours. Katlin went with a checkerboard theme with her dress and party colors. The cake flavor was yellow with butter cream icing. It was covered and decorated with our hand made marshmallow fondant topped with a fondant - gum paste bow and the # 16 as the cake topper. Thanks Katlin for letting me be apart of your special celebration. I hope to create many more cakes for you and your family. 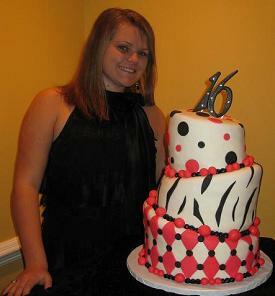 This sweet 16 birthday cake was for a young lady, Mercedes, from Raleigh. She had a huge sweet sixteen party at the ESS Lounge in downtown Raleigh. She wanted to go with the Winter Wonderland theme cake so she drew up her own picture of what she wanted her cake to look like. Each tier was a different flavor, marble with butter cream icing, yellow with butter cream icing, chocolate with butter cream icing, and last, yellow with cream cheese frosting and strawberry filling. Yum! 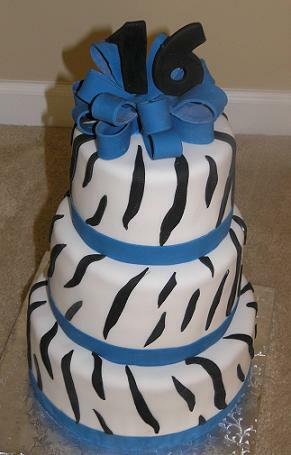 A returning customer, Marie Carroll of Willow Springs, ordered this zebra cake. Her daughter was celebrating her sweet 16 birthday. The zebra cake flavor was yellow and covered with marshmallow fondant and even the bow and numbers are hand made fondant. This is a wonderful, down home family, who I have become friends. I recommend their towing service to everyone. They own State Wide Towing; their number is 919-557-9494. I look forward to the next celebration! 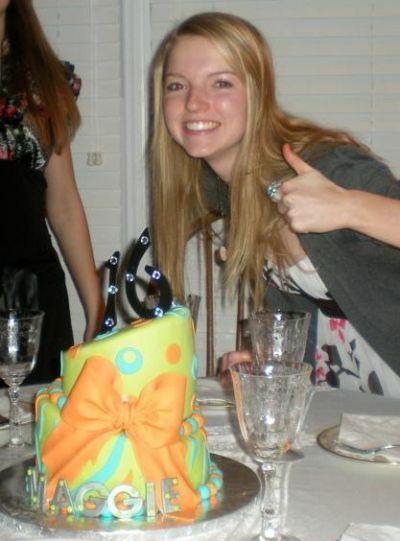 E-Mail Steph About Your Sweet 16 Birthday Cakes Here. 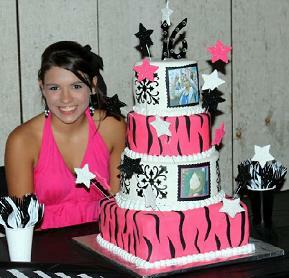 This 16th birthday cake was ordered by a loving mom for her daughter Stephanie. 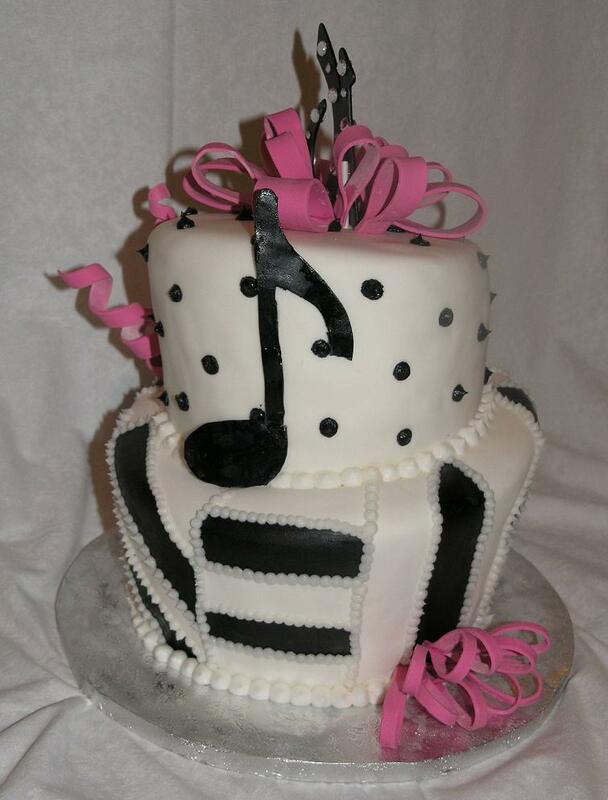 The music cake was chocolate and yellow flavor with butter cream icing covered with marshmallow fondant. 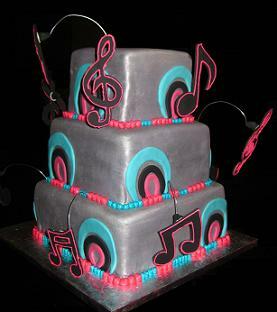 Aimee G. of Raleigh ordered this music note cake theme for her daughter Sarah’s sweet 16 birthday party. Sarah had drawn a sketch of what she wanted her cake to look like along with photos from the Internet and wanted to integrate several designs into one cake. 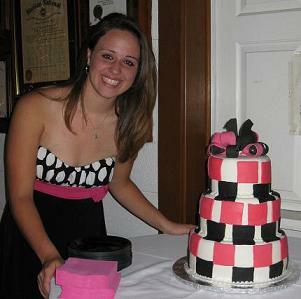 Her sweet 16 cake flavor was chocolate with butter cream icing covered with marshmallow fondant, the music notes were made from gumpaste and fondant then outlined in hot pink royal icing. Hear this music note cake swing baby! If your planning a sweet 16 party I highly recommend checking out these great Sweet 16 Birthday Cakes for great cake ideas, themes, tips and tricks to make your sweet 16 experience the hit of the year!